Posted on 20th February 2017 by admin. Colour can be seen as the most important and influential aspect of a room’s character. Colour defines the mood of a room and to varying degrees, the mood of those who occupy it. Colour can also influence our perceptions of the shape and size of a room and the furniture within. As a general rule, rooms painted in light colours feel larger than those painted in dark colours. Ceilings painted a similar colour to the walls will appear higher, as there is less contrast at the transition between them. Sofas, chairs and furniture in bold colours will appear larger within neutrally coloured rooms, creating powerful and engaging accents. To play down larger pieces of furniture, choose them in neutral colours that are either sympathetic to their surroundings or lighter contrasts to boldly coloured walls. But if you’ve already made your choices for sofas, chairs and furniture and aren’t brave enough to splash vibrant or bold colours onto walls, doors or woodwork, what are your options? Controliss battery powered and mains powered electric blinds offer the perfect compromise and are a practical and elegant way to experiment with colour. Whether you want to take things one step at a time by starting with a muted, neutral palette or you’re prepared to be adventurous and want to throw caution to a coloured wind of change throughout your home, Controliss have something for you. Dove, Calm Sand, Buff or Cornsilk will add a subtle warmth to clean, neutral rooms without compromising sophisticated style. Alternatively, playful hearts will be won over by Regal Blue, Lust, Purple Majesty, Kiwi or Tangerine. And unlike a painted surface, Controliss remote control electric blinds allow you to vary the amount of colour on show. Bring blinds down for maximum impact when entertaining; raise them half way for stylish accents; or raise them further for subtle hints of your true personality. So, if you’re sold on the idea of introducing a splash of colour into your home spaces, where do you start? Well, a Controliss battery powered and mains powered electric blind in whatever colour you desire, is certainly less of an undertaking than decorating, whether with paint or wallpaper. 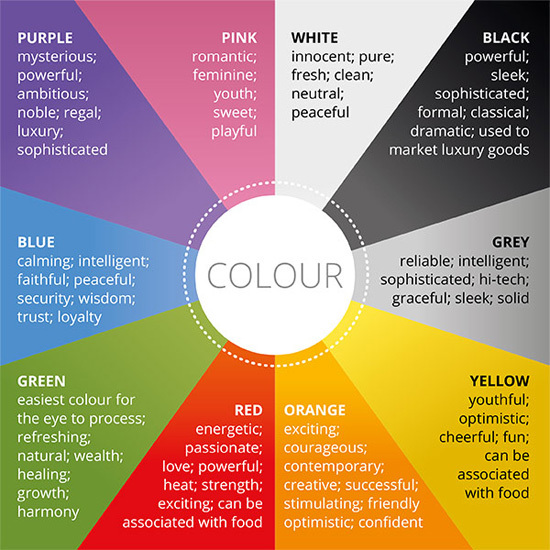 To help you decide on which colour captures the mood you’re after, we’ve included a colour wheel, below, highlighting a spectrum of options with brief suggestions of the moods they help create and characteristics they embody. Posted on 15th February 2017 by admin. The recent CES Technology Show in Las Vegas was THE place to see and learn of, the very latest trends in all things 'tech'. The 2017 presentations didn’t disappoint; from self-balancing Honda motorcycles, through the latest TV and computer developments, to Lynx - the humanoid robot powered by Amazon’s Alexa virtual assistant. We’ve been told for years now, that ‘this will be the year of the automation of things’ and from the CES highlights that have made the news, 2017 certainly looks to be the year home automation gains credible traction. Whether you yearn for connected fridges, microwaves, vacuums, or robotic personal assistants that will fill your fridge, cook your food and keep the home clean, it now seems no longer the stuff of science fiction - the future is here, now. But if an addition to the family in the shape of a robot is one huge step too far and you’d prefer to remain very much in control, yourself, the home automation systems that Controliss battery powered and mains powered electric blinds can be integrated into, may be the perfect solution for you. Powered by technology from market leaders Somfy, all Controliss electric blinds are compatible with the systems that are leading this revolution in home automation. Whether your interest in joining this revolution comes from the security benefits of remote control blinds; the elegant practicality offered by wireless fitment; or the sophisticated functionality of programmable control, Controliss has the perfect solution to your needs.